General objectives of the project: Ocean artUp aims to study the feasibility, effectiveness, associated risks and potential side effects of ocean artificial upwelling in fertilizing ocean productivity and enhancing energy transfer to higher trophic levels with the potential of raising fish production. Ocean artUp will further investigate the impacts of artificial upwelling on biogeochemical cycling, including carbon export potential, and air-sea gas exchange of climate relevant gases. Specific objectives of 2019 campaign: In the ocean, the Si:N:P ratio of inorganic nutrients varies with depth due to preferential remineralisation of the different elements, with Si increasing with depth relative to N and P. From a technical and logistical perspective, it is advantageous to minimize the depth of deep water upwelling. From an ecological and biogeochemical perspective it may be beneficial to favour diatom growth for maximum yield in trophic transfer and export efficiency, which may require upwelling of nutrient-rich water from greater depth. 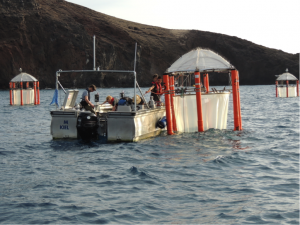 To test the quantitative importance of diatoms in food web dynamics and export fluxes we will apply a gradient of Si:N nutrient addition to a natural plankton community in subtropical oligotrophic waters off Gran Canaria. 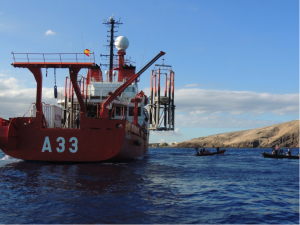 We invite external users who are approved for AQUACOSM TA access to join our Ocean Artificial Upwelling KOSMOS experiment off Gran Canaria planned to run from September to November 2018. We welcome experts with any complementary expertise (see below). A total of at least 390 person days will be allocated to external users in 2018 of AQUACOSM Transnational Access provision. KOSMOS experiments planned in the next 5 years and already funded include studies on the effects of ocean deoxygenation in oxygen minimum zones of eastern boundary upwelling systems, effects of ocean acidification on oligotrophic pelagic systems, and the potential of artificial upwelling in raising productivity and fishery harvest in unproductive ‘ocean deserts.’ Experiments in 2018 are expected to be conducted in oligotrophic, subtropical waters of Gran Canaria or Cape Verde. Access will be provided to 6-9 users for 50-65 days. Abstract: The productivity of the ocean is limited by the transport of nutrient-rich deep waters to the sun-lit surface layer. In large parts of the global ocean this transport is blocked by a temperature-induced density gradient, with warm light waters residing on top of heavier cold waters. These regions, which are referred to by scientists as ocean deserts, are presently expanding due to surface-ocean warming. Enhancing the upward transport of nutrient-rich deep waters through artificial upwelling can break this blockade and make these waters more productive. Forced upwelling of deep-ocean water has been proposed as a means to serve three distinctly different purposes: (1) to fuel marine primary production for ecosystem-based fish farming; (2) to enhance the ocean’s biological carbon pump to sequester CO2 in the deep ocean; (3) to utilize the surface to deep-ocean temperature gradient to generate renewable energy via Ocean Thermal Energy Conversion (OTEC). Whereas theoretical and technical aspects of applying artificial upwelling for these purposes have been studied to some extent, the ecological responses and biogeochemical consequences are poorly understood. Ocean artUp therefore aims to study the feasibility, effectiveness, associated risks and potential side effects of artificial upwelling in increasing ocean productivity, raising fish production, and enhancing oceanic CO2 sequestration. Objectives: Possible applications of artificial upwelling for the purposes outlined above have their greatest potential in tropical and subtropical regions. As most of these regions are permanently stratified with year-round low productivity, their pelagic ecosystems are adapted to low nutrient supply. Applying artificial upwelling in these environments is likely to induce dramatic changes in the structure and functioning of the local ecosystems, with potentially undesirable side effects on marine life and related ecosystem services. Ocean artUp will investigate the biological and biogeochemical responses to deep-water supply into oligotrophic environments in order to establish a knowledge base for a comprehensive assessment of the feasibility, effectiveness, associated risks and potential side effects of this approach. For this purpose, Ocean artUp will address a variety of key questions at various levels of biological organization. What phytoplankton composition develops in response to deep-water upwelling? How is this affected by the nutrient stoichiometry (silicon to nitrogen to phosphorus), the rate and mode (pulsed vs. continuous) of nutrient supply, the mixing ratio between deep and surface water and the season? How do these variables affect the efficiency of nutrient utilization? What is the food quality of primary producers for higher trophic levels? What type of food web establishes with how many trophic steps to harvestable fish? What is the transfer efficiency between primary producers/primary consumers and primary/secondary consumers? What is the food quality of secondary producers for higher trophic levels? Under what conditions do low numbers of tropic steps combine with high transfer efficiencies towards high yield of harvestable fish? How does the inorganic carbon to nutrient ratio in the source water affect the in/outgassing of excess CO2? How does the Si:N:P ratio in the source water affect the stoichiometry, sinking, and remineralisation rate of deep water-derived organic matter? How does deep water supply rate, mode of supply and season affect the above processes? What is the export and carbon sequestration potential of artificial upwelling with source waters of different chemical composition? What is the risk of favouring growth of harmful algae? What is the effect of artificial upwelling on the production of climate relevant gases? Does artificial upwelling pose a risk to ecosystem health in the surrounding environment? The Kiel Off-Shore Mesocosms for Ocean Simulations (KOSMOS) are a seagoing mobile platform for mesocosm experiments. They can be deployed from any mid-sized research vessel. KOSMOS comprises 9 free-floating units, each consisting of a floatation frame and a flexible bag 2 m in diameter (Fig. 6.6.1). After deployment in the sea, the bag unfolds by weights pulling down its lower end to 20 m depth, thereby enclosing an undisturbed water column of 55 m3. The bag is then closed at the bottom by a full-diameter sediment trap. Regular cleaning of the mesocosms prevents wall growth and thus enables long-term experiments that capture plankton seasonal succession and potentially microevolution. The enclosed water encompasses the entire plankton community up to the level of fish larvae and small pelagic fish. Sampling of sedimented matter in combination with frequent measurements of dissolved and suspended matter and air-sea gas exchange can be used for budget calculations of major elements (C, N, P, Si). Potential experimental perturbations include the addition of inorganic nutrients or organic compounds, CO2 enrichment, manipulation of mixed-layer depth, simulation of deep-water upwelling, species exclusion and addition of invasive species. Sampling devices include depth-integrated and discrete water samplers, nets, gas tight samplers, and sediment samplers. Various sensors continuously record physical and chemical characteristics of the enclosed water along depth profiles. The KOSMOS facility was successfully employed in long-term experiments in different climate zones, ranging from the high Arctic (Fig. 6.6.2) to temperate waters in the Baltic and North Sea to oligotrophic waters off Gran Canaria and Hawai’i. These studies, which focussed on the effects of ocean acidification, plankton dynamics and biogeochemical cycling, involved researchers from a wide range of scientific fields, including marine and atmospheric chemistry, molecular and evolutionary biology, marine ecology and biological oceanography, aquaculture, fish biology, and biogeochemistry. Results of the KOSMOS experiments have been used in various ecosystem and biogeochemical modelling activities. Fig. 6.6.1. 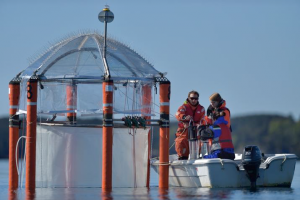 A KOSMOS mesocosm with flotation frame (5.8 m high, 2.8 m diameter) made of fiber-glass and stainless steel, a flexible bag of thermoplastic polyurethane and a sediment trap at the bottom, which is sampled with a hose descending from the surface. KOSMOS: mobile meoscosm structure can be installed on any study site, transportation with RVs and/or in standard 20 and 40-foot containers. A total of at least 1170 person days will be allocated to external users in years 2 and 3 of AQUACOSM Transnational Access provision. KOSMOS experiments planned in the next 5 years and already funded include studies on the effects of ocean deoxygenation in oxygen minimum zones of eastern boundary upwelling systems, effects of ocean acidification on oligotrophic pelagic systems, and the potential of artificial upwelling in raising productivity and fishery harvest in unproductive ‘ocean deserts.’ Experiments in 2018 and 2019 are expected to be conducted in oligotrophic, subtropical waters of Gran Canaria or Cape Verde. Access will be provided to 9 persons for 65 days each year.